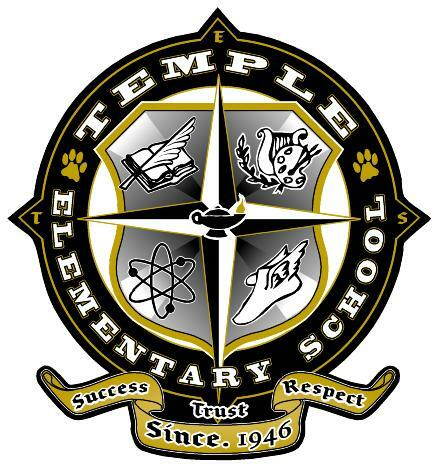 Temple Elementary School will be recognized as a leading force for educational excellence. Temple Elementary is reaching every student, teaching every student, and inspiring student success. Temple Elementary School is one of 24 schools that make up the Carroll County School System. The Carroll County School District is primarily a rural district situated approximately 50 miles from Atlanta, Georgia. The district is comprised of five regular highs schools, six middle schools, twelve elementary schools, a charter college and career academy, and an alternative program. Temple Elementary School serves the pre-kindergarten through fifth grade students of the Temple Cluster in the Carroll County School District. Temple Elementary School was opened in 1958 as Providence Elementary and changed to Temple Primary in 1968. Other schools in the Temple Cluster include Providence Elementary School, Sharp Creek Elementary School, Temple Middle School and Temple High School. Temple Elementary School serves as part of the Temple Cluster Schools. Temple Cluster is made of of 3 elementary schools wich are Temple Elementary School, Providence Elementary School, and Sharp Creek Elementary School. These three school feed into Temple Middle School and Temple High School to serve the students and community of the Temple area. Click on our video below to learn more about our cluster of schools and how we are beaming with Tiger Pride!